This is the dragster chassis that I paid too much for and hardly has a usable part on it. Believe me, it looks better at this distance than it does up close. The original work was great, but someone tried to update it. It is full of bad cuts, bad welds, bad grinds, cracked tubes, cut tubes, misaligned retrofits and God knows what all else. It will be a real challenge to get it going again. 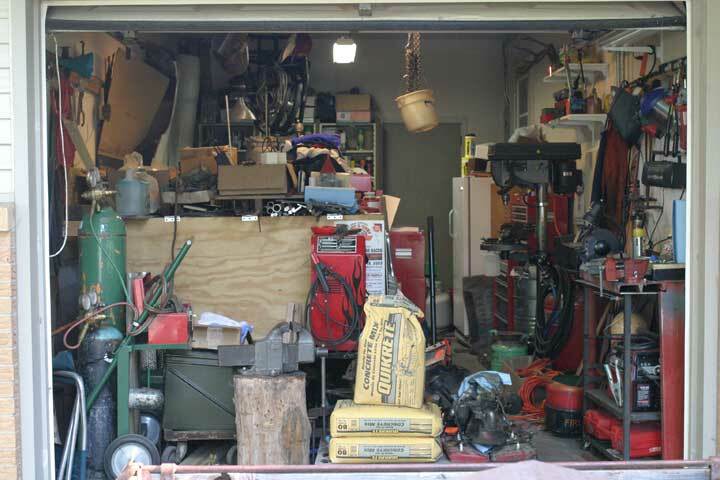 My oldest son, who's MG Midget is filling up my one car garage (see below), paid some penance by helping me lift the dragster up to the ceiling. His suggestion was to get pulleys next time. So, here she rests waiting my the next move. My next move is going to be to finish the MG Midget that my son purchased for $100, which should give you some idea of it's condition. He and a friend completely disassembled it before he entered college. He graduated several years ago by which time I had taken on the project myself against the sound advice of my wife. Now thousands of dollars later, it still graces my garage and interferes with my working on the flathead dragster. I'm just thankful Midgets are tiny. Yes, those are flatheads lined up against the left wall. There are even a couple that don't have obvious cracks, but they haven't been magnafluxed or pressure tested. Now several years have gone by and instead of things getting better, they have gotten worse. 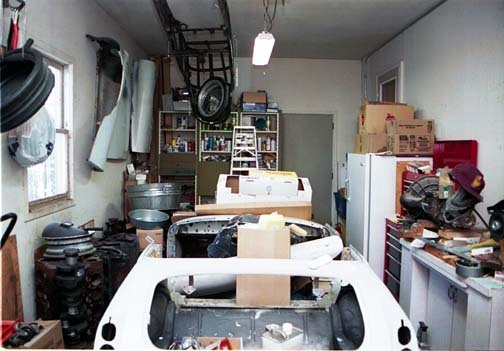 Here is what the garage looks like in the Fall of 2005. Substitute another flathead block for the concrete sacks in the foreground. The plywood box is around the MG Midget to protect it from the blacksmithing and welding activity of my youngest son who moved in with us and brought all his stuff. 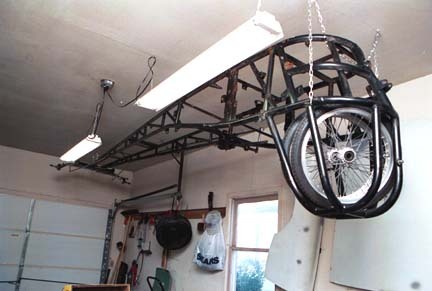 It is so hard to get the Midget out of its "mini-garage" that I have done nothing on it. On the other hand, there is some progress on the dragster. Two blocks have been magnafluxed and are good. My younger son is now an actual welder, including TIG, and hope springs eternal that tubing repairs can be made. I am also itching to build a H.A.M.B./Gas Rail. If that means nothing to you, see the 2005 Hamb Drags and the 2005 American Hot Rod Reunion sections.